Unsere Schule in Uganda, Mbuye Farm School, Fluchtursachen bekämpfen. With the progressive developments, two educational Institutions have emerged. 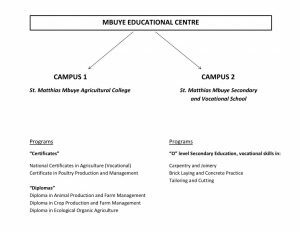 One is St. Matthias Mbuye Agricultural College and the second is St. Matthias Mbuye Vocational Secondary School. Currently, the Centre is sited on 103 acres of land with two campuses for the above Institutions. A centre that started with 15 now has 753 students (March 2018) in the two institutions with 95% boarders and more than 60 staff members. Over time the school keeps track of her products to evaluate the impact in the community and relevance of the training to the students. These tracer studies reveal that good change agents have put a legacy in promoting food production and self – employment; any training gap identified during the tracer study is considered in the curriculum during the review sessions. The school has produced many progressive farmers, Religious leaders like Priests, Nuns, and successful entrepreneurs, medical Doctors, Nurses, Professional teachers and a good number still in the academic path way upgrading. Currently the Education Centre is owned by Masaka Catholic Diocese. The Institute has made remarkable developments attained since inception. The list is endless; however one cannot forget to mention a few. Registration of the school with the Ministry of education and sports which gave us a legal status to operate as a private institute in Uganda. Developing a strong alliance with our German friends who have been a cornerstone for the school infrastructural development. Passing out of very many skilled men and women in various fields for the country’s sustainable development. Increase in students’ enrolment from 15 students in 1987 to the current 753 in both institutions. The Institute over time has employed very many people helping them to sustain themselves. Infrastructural development including introduction of hydroelectric power in the area, piped water, building many structures including classrooms, dormitories, staff quarters, Health Care Centre , Sports grounds, farm structures like Dip tank, spray race among others. Our strong collaboration with Higher Institutions of learning, including OSnabruek University , Uganda Martyrs’ University (UMU), Makerere University – Kabanyoro Station, District Agricultural Training Centres (DATICS), National Research Institutes, Farm Schools which has kept us relevant. Under the continuous staff professional development program, many of our staff have been able to upgrade/ further their studies with bachelors and masters degrees in various fields of study. As we recall the humble beginning of the Institute and compare with the current level, we thank God for the blessings. We pay special tribute to all the stakeholders in this development, not forgetting the Founder and Director Rev.Fr. Matthias Lusembo, the subsequent Governors, Benefactors, Administrators, All staff teaching and Non-teaching, Parents, Students and the community for their contributions towards the steady progress.